Life is not the way it's supposed to be. It's the way it is. The way you cope with it is what makes the difference. Sunday afternoon we took the girls to the Center to see Fletcher. We had planned on going to a family room like we had done in the past. So we got Fletcher all ready while the girls waited out in the hall. He was very excited to see his big sisters! When we got into the family room Fletcher started crying and shaking his head 'no, no, no.' We took that as 'get me out of here' so we walked the halls of TCC for about an hour. He loved being out of that unit. It's been weeks and weeks since he's been to school. Hopefully he'll go to school on Thursday. I decided that I would walk him around the building everyday so we won't end up with the 'no, no, no' business when he goes back to class. When Fletcher gets to upset that's when he starts having problems so I hope getting him out of the unit will help. Maddie was cracking up her bubba! When I arrived at TCC there were a lot of people waiting in the lobby. Well, they were waiting for Roy Williams who used to be a defensive back at OU and now he plays for the Dallas Cowboys! He was taking a tour of the facilities while Fletcher and I were taking our morning walk. Some of the TCC PR people introduced Fletcher and I to him and he seemed very nice. I wish we could've had Fletcher's picture taken with him. We did get an autograph football card. So that was neat. We also had another treat today. 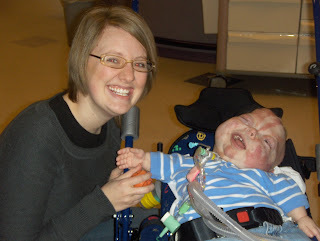 My sweet friend Christa came to the Center to see Fletcher. I haven't seen her in over two years. It was such a blessing to get to sit and chat with her. Fletcher fell in love with Christa and showed her all his tricks! All this in an hour and a half! It was a busy morning at TCC! I know I have been so disconected from the blog world lately, but today I had a few minutes and one of the first places I wanted to visit was your site and Fletcher. I am glad to see him smiling so joyfully. I have to tell you that our LOOOOOOONG dragging winter has been getting us down over here what with hubby missing so much work and us going into the poor house. But even more than that, I was praising God for my FREEDOM to move about and spend so much time with my hubby and that got me to REALLY pleading for Spring to come. It can't be any fun to be stuck in one place for so long. So we are praying for sweet Mr. Fletcher and hoping that all the yuckies soon go away! Love the laughing! Yeah, that Big Sister makes all of us laugh! What a treat to see your friend and get that special time with her and your sweet boy. I also love that Fletcher had a chance to meet Roy Williams. My husband and I are huge Cowboy fans. Well, I'm a fan, and my husband is an obsessed fan. Love that Fletcher has the biggest smile! Well let's see...I am a Christian and earnestly seek to know the Lord's will for my life as a wife and mother. Striving each day to surrender to His will. I am married to a wonderful man and my best friend, Craig. We have three kids Kayleigh, is 18 years old she is funny, sweet and a great help to dear old mom. Then there's Maddie she's 10 years old she loves to talk, read, play, talk and is a big help to mommy also. And our son, Fletcher is 7 years old. 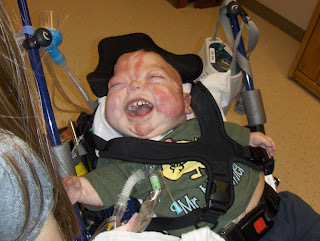 Fletcher is a smart, amazing, funny, ventilator dependent, joy of our lives! My children are my favorite subjects to write about and I hope you enjoy reading about this journey I call my life! "If the mountain was smooth, you couldn't climb it"